Classic and chic, this bridal gown was made for older, more sophisticated brides. 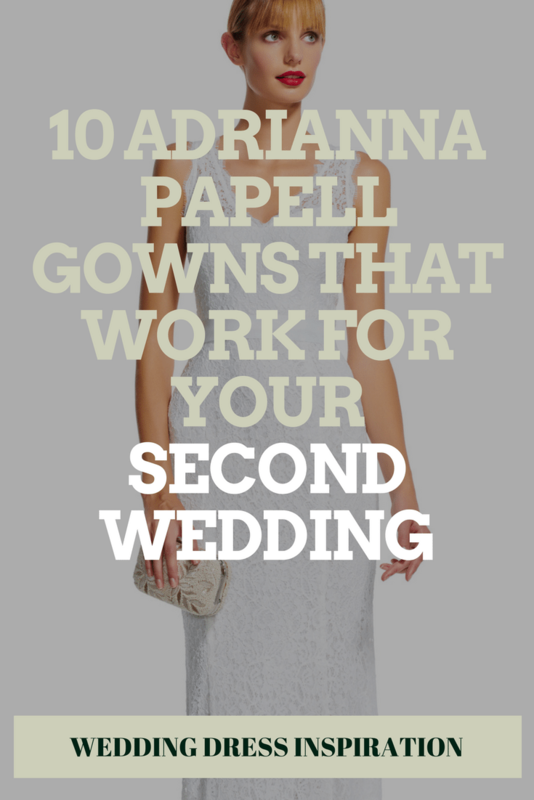 Maybe it’s for a city hall ceremony, in your family’s church or a destination across the country, your second wedding can be perfectly topped with a gorgeous Adrianna Papell gowns. From sequins to a pop of color, she’s got a mix of gorgeous dresses to choose from. Long or short, A-line or straight, decide on what you want to show off or cover up before you do some browsing. Are you interested in colors or maybe adding a bit of traditional flavor to your day of look? Whatever the case, these designs are quite versatile for more sophisticated, older brides. Take a peek below at 10 of our favorite styles from Adrianna Papell’s collection. They’re affordable, accessible and a beautiful compliment to your celebration. The modern lines of this gown will have you looking and feel slender as you shine down the aisle. For an elegant, evening celebration, you can slip on one of these full-sparkling designs that will have the entire night full of vivaciousness and comfort. Maybe you want a bit more detail and intricate beadwork, this gown has that with a blushing shade that's versatile on all skin tones. Your something blue for the day could be your dress itself, and with a bit of sparkle, you'll still feel very bridal. We're swooning for the scallops on this dress and the fact that it hits a woman's figure in all the right places. Maybe you're looking to go a bit shorter, this design mixes tradition with something that's fit for a destination celebration! Throw the party of the year in this sparkling stunner, renew or vows or walk down the aisle all over again with a bout of sparkle! We're loving this chic, sheath wedding gown too, filled with whites and glimmer. And finally, the multi-textures and fun design of this gown make it perfect for a walk down the aisle in a dreamy, whimsical way.